The Labour Animal Welfare Society will hold its annual Day Conference on Saturday 11th March 2017. The provisional agenda will include speakers on a range of subjects including how Brexit will affect the animal welfare agenda, CCTV in slaughterhouses, the ivory trade, shooting and the strengthening of animal welfare legislation. The conference will be held in London at Bloomsbury Central Baptist Church, 235 Shaftesbury Avenue, London WC2H 8EP, a vegan buffet lunch will be provided and tea and coffee will be available throughout the day. To secure your place at the conference please complete the booking booking form. A few months ago, Jeremy Corbyn and the then Shadow Secretary of State for DEFRA, Kerry McCarthy, commissioned Nick Palmer, former Labour MP for Broxtowe, and Michelle Thew, former PPC for Bexhill and Battle and CEO of Cruelty Free International, to prepare a substantial animal welfare package. After wide consultation with interested organisations, the package was formally presented by Michelle and Nick at the LAWS fringe event at the Labour conference, where it received a very warm welcome, and it featured in the Conference speech of the current Shadow Secretary of State, Rachael Maskell. It will now enter the Labour policy machinery, but LAWS supporters are encouraged to send comments to the authors at: animalslabour@aol.com and, if they agree with the direction of the document, to ask their CLPs and MPs to send an endorsement. Of all the issues confronting a new leader of the Labour Party, and a party seeking to regain the trust of the electorate and govern the country in five years time, animal welfare isn’t at the top of the agenda. But it is an issue that many voters care passionately about, as any MP will be able to tell you, from the number of emails currently filling their inboxes on fox-hunting, the badger cull and seal slaughter. and, with a government determined to press ahead with a vote on repealing the hunting ban, it is very topical too. As Labour said in the forward to its 2015 animal welfare manifesto “Protecting Animals” our Labour values tell us that we have a moral duty to treat animals in a humane and compassionate way. We have a proven track record in government: introducing the Animal Welfare Act 2006: legislating to ban fur farming ; securing a ban on cosmetic testing on animals; and, of course, the Hunting Act 2004. Our manifesto for animals focussed on six key pledges: to defend the hunting ban; to end the inhumane and ineffective badger culls; to protect dogs and cats from back street breeders, puppy-farming, trafficking and other irresponsible and cruel practices; ban wild animals in circuses; to tackle wildlife crime and cruelty on shooting estates; and take an international lead on issues like commercial whaling and protecting endangered species, which require global co-operation. As Labour leader I will be 100% committed to this agenda, much of which we can push forward even though we are not in government. Urging the SNP MPs and anti hunt Tories to vote with us against a repeal of the hunting ban, for example. Continuing our opposition in Parliament to the badger cull. Pushing the Government to make good its manifesto commitment to ban wild animals in circuses – something which it promised in the last parliament but failed to deliver. Our shadow DEFRA team in the last parliament did a great job. We know that we have the public behind us, and some excellent campaign groups too. Labour under my leadership will seek to build a coalition in the country of everyone who cares passionately about animal welfare and that how we treat animals-with compassion, care and respect – defines us as human beings. As Gandhi said, “ The greatness of a nation and its moral progress can be defined by the way its animals are treated”. I would not be proud to lead a country where wild animals are ripped apart by hounds in the name of sport. I will also look at what else we can do from opposition, while developing an ambitious agenda for government in five years time. Labour should be ready to listen, as well as ready to lead. By working together we can set the agenda on animal welfare, starting now. Animal welfare is a hugely important issue and one I know is extremely close to the hearts of thousands of Labour members.Since 1997, Labour governments have achieved a great deal in this field – vital work to end cruelty, which the Tories are now trying to undo. Ours is the only party that can be trusted on animal welfare, as our track record has proven – as well as ending hunting with dogs, Labour also banned fur factory farming and brought in the Animal Welfare Act. The Labour government and European Parliamentary colleagues were instrumental in winning a European ban on the import of commercial seal products. Sadly, a move to get rid of battery cages for gamebirds was cruelly reversed by the incoming Conservative/Liberal Democrat government. We set up a world-leading centre dedicated to using science to eliminate the need for using animals in experiments, and pledged if we returned to government to prevent unnecessary animal experimentation by requiring a strong and specific justification for all experiments. And in the manifesto we took to the country in May, our party once again demonstrated its commitment to protecting animals, with pledges to continue to protect the Hunting Act, ban the use of wild animals in circuses and end the ineffective and cruel badger culls. In addition, I would like to see clear labelling for real fur products to protect consumers as well as animals. As Labour leader, I would continue to carry the mantle for animal welfare – taking on David Cameron and the Tories from day one. We cannot allow the huge inroads we made as a party in bringing animal welfare to the fore to be steamrollered, and as a party we know the overwhelming public view is against fox hunting and the culling of badgers. I voted for the hunting ban in 2004 and I believe it would be completely wrong to lift the ban now. I think David Cameron is wrong to insist on reopening the issue now by bringing forward another vote which might repeal the ban. Alongside our shared commitments to human rights and environmental justice, our party has a strong commitment to animal welfare. As a vegetarian all my adult life, I have used my position in parliament to advocate for greater animal welfare protection. The last Labour government achieved much to reduce animal suffering: banning hunting with dogs, securing an end to cosmetic testing, banning fur farming, and introducing the Animal Welfare Act. I supported all these measures. One of the first set of questions I tabled after I was elected to Parliament in 1983 was about the use of animals in tobacco research experiments. I also campaigned against the use of primates in research, and I negotiated tougher regulations with ministers on how they are imported for use in research, and as pets, under the Animal Welfare Act. In this Parliament I will continue my lifelong opposition to hunting with dogs. I have also voted, spoken and campaigned for a ban on wild animals in circuses and I opposed the badger cull in the last Parliament. I was a childhood opponent of fox hunting growing up in Shropshire. Back then we had otter hunting, badger baiting and hare coursing. Gradually we got legislation to end all these awful practices. It was my old friend Tony Banks who finally got the badger as a protected species – I was quoted in the press calling it ‘A Good Day for Brock’ when it finally went through. I have supported the campaign against the dog meat trade, as well as campaigning to ban imports of foie gras, following India’s welcome lead on this issue. Our country and our party have much to be proud of on animal welfare, but we still have further to go to match the best practice around the world. This is another reason why we must resist the Transatlantic Trade and Investment Partnership (TTIP), which would threaten the European and national legislative protections that we have campaigned together to achieve. If elected leader, I pledge that a Labour government in 2020 will continue to advance our animal welfare protections so that they are the best in the world – and I hope that you will hold me to that pledge. We have a moral duty to treat animals compassionately. Under the Tories, that principle is at risk. With me as Leader, Labour will return this moral principle to government. The risk to animals is very real. I will vigorously oppose any proposals to amend or repeal the law on hunting with dogs and will give Labour MPs the chance to bring back the ban if the Tory proposals succeed. Badgers too are in danger. The badger cull is unscientific, inhumane and ineffective. It is appalling that the second year of culls went ahead when they had already been described as an ‘epic failure’ by the former Chief Scientific Advisor to Natural England. As Leader, I’ll oppose these expensive, ineffective and inhumane culls. We need to put scientific evidence at the heart of policy, prioritising vaccinations and bringing in stricter cattle measures. The Tories have failed to protect circus animals. There should be an unambiguous ban on the use of wild animals in circuses. I’d hold the Tories to account for their failure, and will make sure a Labour government delivers a ban. Our duty to protect animals means protecting domestic pets too. When it comes to dangerous dogs, primary responsibility lies with owners. In government we placed a duty of care on owners. Those measures need proper enforcement and the provision of better training. We also need responsible breeding. I am committed to reviewing the breeding practices and sale of dogs and cats, including making sure strong welfare standards apply to the online trade of puppies and kittens. On these issues and many others from snares to birds of prey, Labour is committed to change. However, we will only be able to act in government. Protecting animals relies on us understanding how we can win again. The last Labour government won three elections. In that time, we banned fur farming, fox hunting and cosmetic testing on animals, and for the first time gave domestic animals key protections. With me as Leader, the next Labour Government will build on this proud record, working with animal welfare groups to end the unnecessary suffering of animals. Labour has a proud record on animal welfare. The hunting ban, the end to fur farming and docking dogs tails, important advances in farm animal welfare, and much more besides all took place under the last Labour Government. 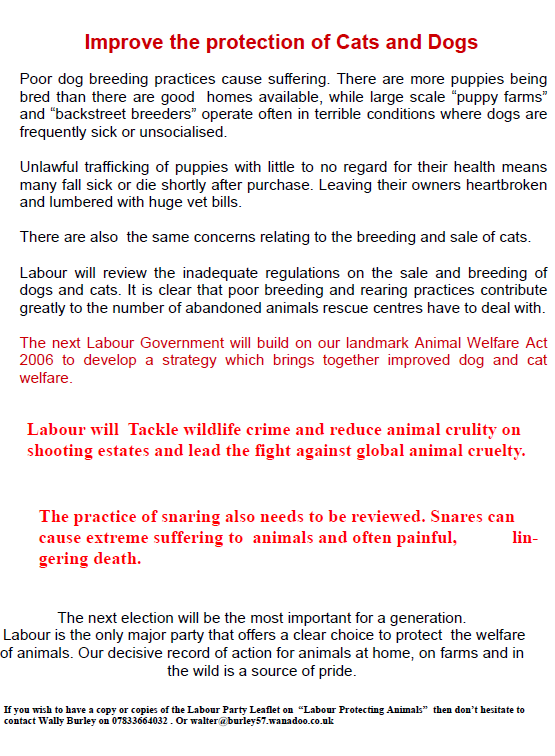 As Animal Welfare Minister between 2003 and 2007 I was proud to take through Labour’s landmark Animal Welfare Act. This was internationally ground-breaking legislation at the time introducing, among other things, a “duty of care”, which made it much easier to take action to tackle cruelty and neglect. During the passage of the Hunting Act, I was threatened and physically attacked by local hunt supporters in Devon. I also led the campaign against commercial whaling within the International Whaling Commission. So I hope my record speaks for itself. How we treat our fellow creatures is a measurement of our humanity. But I’m afraid things have gone backwards under the Coalition and are likely to get worse now the Tories are governing alone. They will seek to overturn the hunting ban, extend the badger cull, do nothing on circuses & stall or reverse improvements in farm animal welfare. We must oppose such moves vigorously. But we also need to develop an ambitious programme of our own to meet the animal welfare concerns of the future. We also need to rebuild our relationship and engage better with animal welfare charities & their millions of supporters. As Deputy Leader, with a wealth of experience in this area, I will work to ensure we do. Progressive politics has always had within its roots a strong commitment to compassion for all. We know that a concern for the welfare of animals and their treatment in a humane manner is the mark of a civilised society. I am proud it has been Labour governments that have put that principle into practice – whether in banning fox hunting, the Animal Welfare Act 2006 or animal testing it has been Labour which has led the way. Yet we know this progress is under threat as David Cameron seeks to hold on to power – his pledge to repeal the fox hunting ban to secure support amongst his backbenches is just the start of the Conservative attack on animal welfare. Under the Coalition, we were given a taste of the Tory view of these issues in the cruel and ineffective badger cull that went against scientific opinion. Like so much of Coalition policy, the Government were more concerned with keeping face rather than listening to expert opinion. So too their failure to protect circus animals, tackle the outdated laws around the breeding of puppies and regulations around the sale of pets highlights how only Labour is committed to ensure fair treatment of animals in Britain. We don’t have to wait until the election to act. As Deputy Leader I want us to be able to work with those who share our values, if not yet our membership card, to defend animal rights and the progress Labour could make it returned to Government. Groups such as the Labour Animal Welfare Society can be a vital bridge between those who have expertise and interest in these matters and the leadership of Labour. I want us to be a movement again of people committed to social justice and capable of championing the causes we care about in our communities at all levels. I have ideas about how to do this using new techniques and new technologies and I want to hear the thoughts of LAWS members too. That’s why I set up a discussion forum to consider how we can do this. I was proud to be part of the Labour Government that ended the cruel practice of hunting with dogs because animals suffering in the name of sport has no place in civilized society. The hunting ban is something I will always fight to keep and will always take the fight to Tories who want to repeal it. The welfare of animals is greatly important to me and will remain so if I am elected as Deputy Leader of the Labour Party. As Deputy Leader I will work to improve the protection of cats and dogs. At present we have ineffective regulation, a lack of information for pet owners and a failure to deal with irresponsible and cruel breeding. We need that to change and that means greater regulation on the sale and breeding of cats and dogs in order to protect their welfare. I also support a ban on wild animals in circuses. Being moved from place to place in cramped and substandard enclosures, forced training and performance, loud noises and crowds of people are distressing for animals. I also want to see an end to the ineffective and inhumane badger culls. Far from reducing Bovine TB, the culls, according to experts will make the problem worse but the Tories have pressed ahead with no monitoring or evaluation. It is down to Labour to stand up to the Tories on this issue and campaign for an end to it. More widely, I support action to end the illegal persecution of birds of prey and support moves to prevent animals getting trapped in snares and I want to see action to ensure humane treatment of game birds. We also have a duty to work globally together to prevent animal cruelty around the world. As Deputy Leader, I would want to push to end all commercial whaling and prevent the poaching and near extinction of endangered species such as elephants, rhinos and tigers. Two months after the General Election, and the Tories’ assault on animal welfare has already begun, with their attempt to unpick the Hunting Act. When I was first elected in 1997 I presented a petition in Parliament calling for an end to the cruel practice of hunting with dogs. I’ve always believed that causing animals to suffer in the name of sport is wrong and I supported the hunting ban in 2004. But David Cameron is now allowing government time for a free vote on its repeal. Yes, this is a Cameron priority. He would like to see again a pack of dogs being set on a fox by a group of people, chasing it on horseback. But he is trying to do this by dressing it up as a need to control vermin. Like you, I despair at the misguided priorities of the Conservatives. My personal commitment to animal welfare is a family affair as my husband used to work at the RSPCA. All our pets have been RSPCA rescue animals and we still miss our dog Joey who was part of our family for 15 years. As a constituency MP, I have supported Yorkshire Wildlife Park’s global conservation mission, working with communities at home and around the world to help save habitats and some of our most at risk species, including the Painted Hunting Dog, which is the most endangered carnivore in Africa. As a minister I led efforts at the Home Office to introduce much greater transparency and openness into the use of animals in scientific procedures. And as your Deputy Leader, I will ensure we build on our proud record in Government, where we not only banned hunting with dogs but secured an end to cosmetic testing on animals, banned fur farming (which closed the last fur farm in my constituency) and much else besides – all causes the Labour Animal Welfare Society championed. 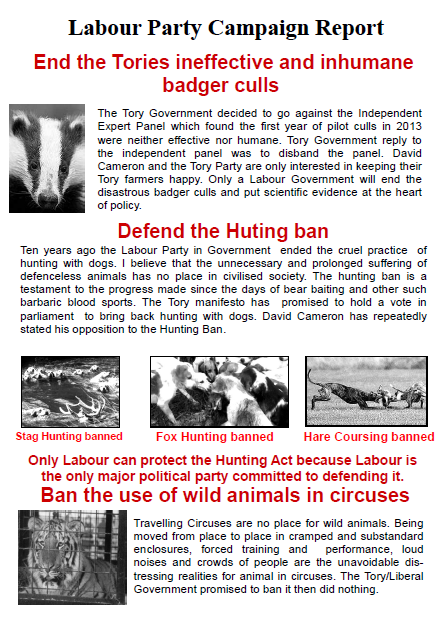 Our 2015 Manifesto proposed a ban on wild animals in circuses, an end to the badger cull, improved protection for cats and dogs, tackling wildlife crime and leading the global fight against animal cruelty. It wasn’t these policies that turned voters off. People care about the suffering of animals and it right that we as a party care too. I’m very proud that LAWS is a Black Country based organisation. Founded, and still chaired today, by my friend Wally Burley, who I’ve known since I was kid, meaning I’ve been a member of LAWS for nearly 20 years – far longer than I’ve been an MP. It’s no exaggeration to say Labour’s 2002 ban on fur farming might not have happened without the work of Respect for Animals the anti-fur organisation run by Nicki Brooks and Mark Glover from Gedling, Wally, and LAWS giving vital support. LAWS helped to keep animal welfare firmly at the top of Labour’s legislative agenda when we were in power. Without their tireless application and determination tens of thousands of animals might have continued to suffer needlessly. The last Labour government showed real commitment to the welfare and safety of animals and it did so, in part, because organisations like LAWS refused to stop shouting about it. In opposition, the information, advice and expertise supplied by LAWS helped to shape Labour’s principled stand against the badger cull. In Government, we banned the testing of cosmetics on animals. I want to see that ban extended so that household products can’t be tested on animals either. LAWS hasn’t always received enough credit for the work it does. But we should all draw inspiration from the passion and commitment its members have shown to the cause of animal welfare, especially at times when the media and politicians chose to focus on other issues. Like LAWS I believe in campaigning hard for the issues that matter, in good times and in bad. And I have always believed we can achieve far more together than we can alone. That’s why I’m standing to be deputy leader of the Labour Party. I hope my track record shows the attributes I would bring to the job: campaining experience acquired during ten election campaigns and a commitment to fight against injustice wherever it exists. I fought to expose phone-hacking at Rupert Murdoch’s News of the World and uncovered child abuse at the heart of the political establishment, a campaign that has led to over a dozen police inquiries.It is only by giving a voice to the voiceless that Labour can begin to rebuild after our devastating election defeat. I believe I have the ideas and the energy to help reform and rebuild our party. I hope you will support me. The conference will include speakers from the Animal Protection Agency, Animal Aid and the International Fund for Animal Welfare. Form can be downloaded here. We do hope that you will be able to attend. Any relevant conference Papers including the agenda and directions and so on will be sent out to those registering to attend the conference. Please note that the venue is just a 3 minute walk from Wolverhampton Railway Station and also just 3 minutes from the Bus Station. There are also car parking facilities at the venue, however please advise in advance if you wish to park so that the necessary arrangements can be made. Nicky Brooks Secretary. Wally Burley Chair. Labour Animal Welfare Policy, have Your Say! Below is a booklet we have just published, LAWS Animal Welfare Policy. There has never been a more important time for you to spend a minute to help formulate Labour’s Animal Welfare Policy for the next General Election. We Labour Members of the House of Commons pledge ourselves to continue to work for Animal Welfare. almost 40,000 whales have been slaughtered during the ban and 2013 will see this depressing statistic increase still more. Antarctic and Pacific, most whaling is taking place uncomfortably much closer to home, and it is expanding pretty much unopposed. far. In Iceland, despite the growing popularity of whale-watching, a quota of 100 minke and 150 endangered fin whales has been set. destined to become dog food! whale products, support the whaling ban and a ban on international trade in these products. sanctions that could end it overnight. 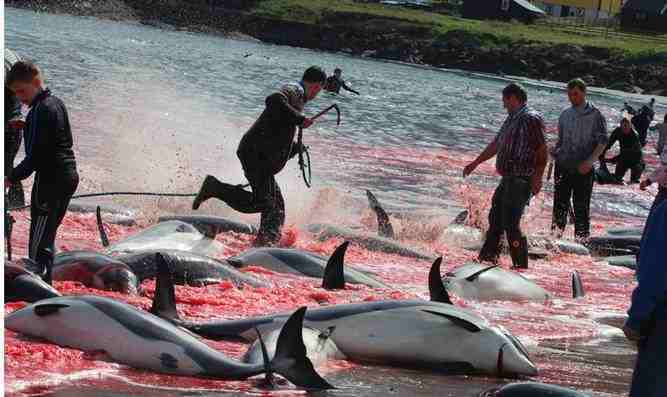 killed in the Faroe Islands alone in just 24 days this summer. only tough government action now can halt this horrifying slide back to the darkest days of whale slaughter.